4 days to go and about 20 tickets left for the Lucky Leprechaun Lap on Saturday. Your ticket includes: $3 or less drink option at each bar, Leprechaun Hat with Beard, Shamrock Glasses, Koozie, Drawstring Backpack, Temporary Tattoos, Photo Booth, Limbo Contest with prizes for winners and No Covers at Scheduled Bar. Harry Potter Trivia in April is sold out but we’re doing a Friends themed night in May. The Pirate Crawl / Booze cruise tickets in June are available now. This entry was posted in LLL and tagged bar crawl, boston, Crawl In Boston, Faneuil Hall, green, ireland, irish, Leprechaun, pot of gold, pub crawl, st. paddy's day, St. Patrick's Day, St. Patty's Day. We hope that you had an awesome weekend. The week has arrived! The bags and koozies were just delivered. This entry was posted in LLL and tagged bachelor, bachlorette, bar crawl, boston, Crawl In Boston, Faneuil Hall, friends, Leprechaun, Lucky, pub crawl. Getting in a Lucky Leprechaun Lap state of mind. 1 week from tomorrow. A blast from the past. I only make these once a year but love, love, love them. 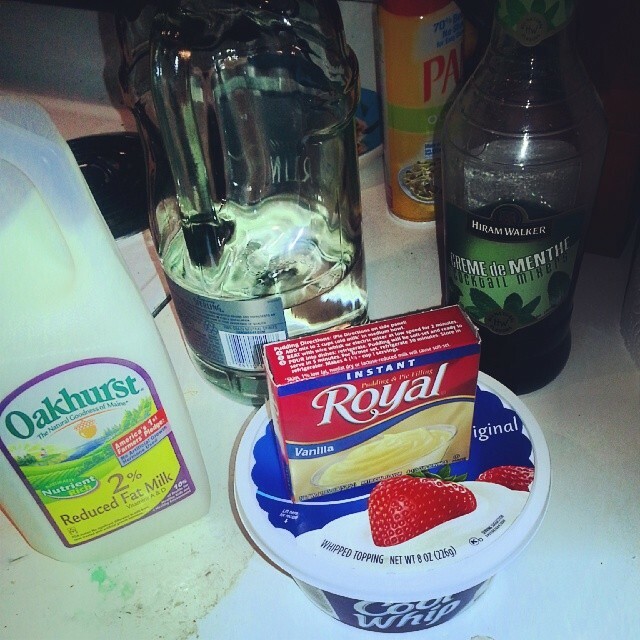 Mix the pudding mix with the milk. Then add the Vodka, Creme de Menthe and mix. Next up add the cool whip and mix. Put into freezer for about an hour and ready to go. Big congrats to Sectumsempra for their victory last night. Only 1 point separated them and our 2nd place Muggles and Molecules team. Last night we discovered that our April 26th session had sold out. Upon further review, it was a software error. We have 4 team slots still available. This will be our final Harry Potter Trivia Night for awhile. Although we are currently working on a Friends themed trivia night. Stay tuned. 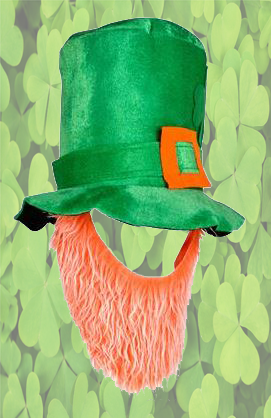 9 days to go until the Lucky Leprechaun Lap! Get your tickets soon as they’re getting scarce. A few teams asked us about their team score from last night. Please see below. This entry was posted in LLL and tagged bachelor, bachlorette, bar crawl, booze cruise, boston, college, Crawl In Boston, Faneuil Hall, Harry Potter, Pirate, Pirate Crawl, pub crawl, St. Patrick's Day. A few weeks ago, we told you about the Drinking around the World bar crawl at Epcot in Orlando. After that, we visited Universal Studios. There wasn’t as much drinking involved, but it’s still a fun day, especially if you’re a Harry Potter fan, like we clearly are at Crawl in Boston! Here are some tips to get the most out of your single day, dual-park pass. We started on the Universal Studios side. We got there fairly soon after park opening and hightailed it to Diagon Alley. It wasn’t too crowded then, and we got right on the Escape from Gringott’s ride. This was a really fun ride, so I’d recommend getting on it early o you don’t have to wait very long! One thing to note, to go on this and the other Harry Potter ride, you can’t bring on bags, even small purses. They have lockers where you can check them (free for the first hour) so make sure you do this before you get in line (we learned the hard way). After the ride, we looked around for a while (there are lots of hidden things to see). Then we did the rest of that park. The Simpsons, Transformers and Minions ride were all fun. We got the Fast Pass, which allows you to go through an Express line, and I think was worth it. You can’t use them on the Harry Potter rides, but it saved a lot of time on the other ones. On the drinks side, definitely try a Wizard Brew or a Firewhiskey in Diagon Alley. In the Simpsons area of the park, you have to get a Duff! It’s not a super amazing beer, but very novel and fun. Taking the Hogwarts Express over to the Islands of Adventure was really fun. At Islands of Adventure, we really only did the Harry Potter and Marvel stuff. A lot of the other things over there, like the Jurassic Park ride, were water rides. It was a pretty chilly January day when we were there, so we didn’t feel like getting wet. If you go when it’s warmer, I’m sure they’re fun. If you want a poncho, you should bring them with you, they were expensive at the park. There are a lot of very touristy but fun restaurants both in the park and in an area between the parking garage and the park itself. A little cheesy, but that’s what you’re signing up for when you go to a theme park. Sometimes you just have to embrace the chains and have some fun. All in all, Universal was a very fun day. Harry Potter Trivia Night this Wednesday is sold out. We’ll be back on Tuesday April 26th. Just over half of our team slots for that are now full. Pirate Crawl tickets now on sale. Early bird already sold out. Our awesome booze cruise/bar crawl. This entry was posted in LLL, MMHO and tagged bar crawl, booze cruise, Harry Potter, irish, Lap, Leprechaun, Lucky, Pirate, pub crawl, trivia. 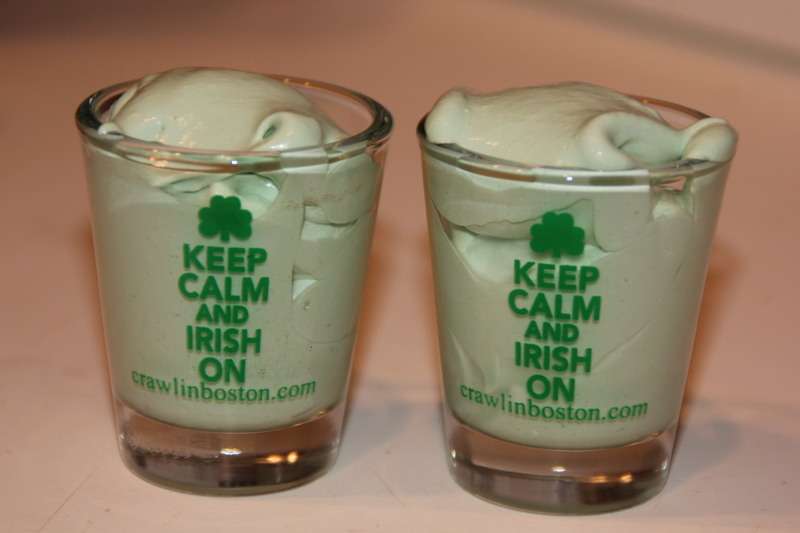 Please join Crawl in Boston on March 12th to lap the Faneuil Hall area as we introduce The Lucky Leprechaun Lap! St. Patrick’s Day parties will be happening all month so why not join ours as well? There are a few other bar crawls the same day so we’re going to have very limited tickets. But we’ve carved out a schedule that we believe will work great. No worries about waiting in line outside or 45 minutes for a beer. Tickets to Lucky Leprechaun Lap begin at $15. You will always get tons of bang for your buck with Crawl In Boston. Harry Potter Trivia Night on March 2nd is sold out. We’ll be back on Tuesday April 26th. This entry was posted in LLL and tagged bachelor, bachlorette, bar crawl, boston, Crawl In Boston, irish, irish pub challenge, Lap, Leprechaun, Lucky, pub crawl, st. paddy's day, St. Patrick's Day, St. Patty's Day.